The Nigerian Army on Friday announced the redeployment of some senior officers in the Defence and Army Headquarters as well as General Officers Commanding including Operation Lafiya Dole. 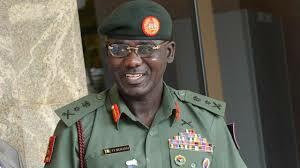 According to a press statement issued by Brig Gen Texas Chukwu, Director Army Public Relations, the redeployment which affects the Theatre Commander Operation Lafiya Dole, Force Commander Multinational Joint Task Force sees Major General AM Dikko taking over as Theatre Commander. The statement went on to reveal that “among the Principal Staff Officers affected are Maj Gen LEO Irabor posted as Chief of Defence Training and Operations in the Defence Headquarters while Maj Gen LO Adeosun takes over as Chief of Training and Operations at the Army Headquarters. Others are Maj Gen HO Otiki, as Commander Infantry Corps and Maj Gen CU Agulanna as Chief of Accounts and Budget Nigerian Army. Maj Gen JE Jakko is posted to Defence Headquarters as Chief of Defence Finance and Budget, Maj Gen AB Abubakar, Maj Gen A Mohammed and Maj Gen LKJ Ogunewe, among others will be proceeding to the Nigerian Army Resource Centre on Course.